**In order to form a division, groups may include competitors within one birth year of each other. Please be sure to weigh your child to ensure you sign him or her up for the correct division. View the weight classes on the Rules Page. THERE IS NO WEIGHT ALLOWANCE AND COMPETITORS MAY NOT WEIGH IN WEARING ONLY THEIR UNDERWEAR. Please keep this in mind when choosing a weight class for your child. Come together and watch a movie at the park! American National IBJJF Jiu-Jitsu Championship. June 28th, 29th & 30th, 2018. Tournament located in South Hall. Help us celebrate NORTH PARK JIU JITSU one year anniversary! A BLUE BELT has awareness of the overall Jiu Jitsu game and has an objective for each of the basic positions. This belt requires SPECIFIC knowledge and is not judged by time in training or athletic ability. Please review Blue Belt Curriculum prior to seminar. 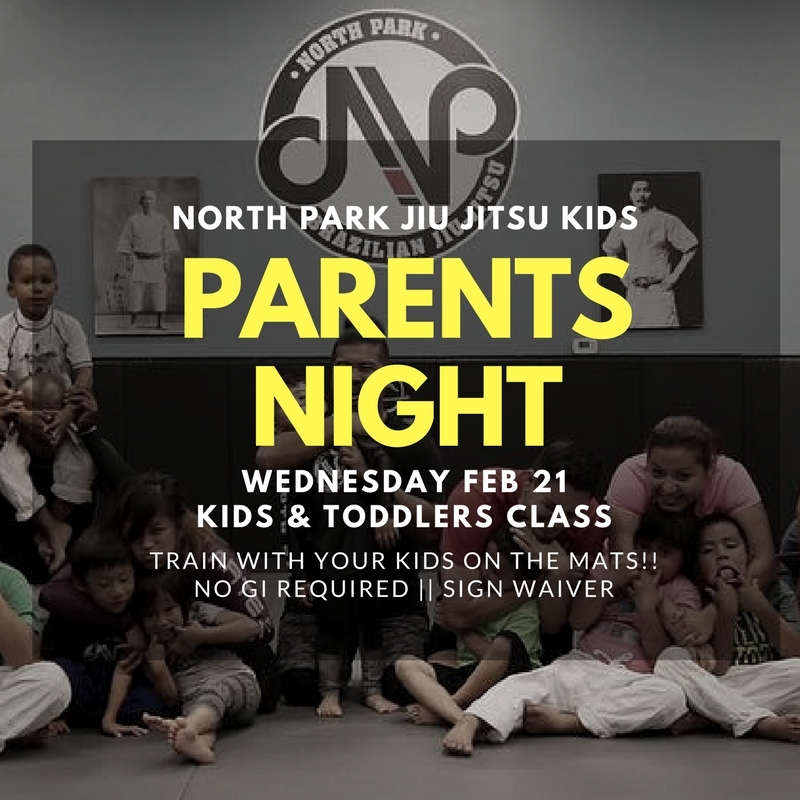 Parents are invited to train with their kids on the mats! Join us for our first annual Adult Ugly Sweater Crawl! Join us for NPBJJ Kids White Elephant Gift Exhange! Pizza and Drinks provided! Feel free to bring a dish/dessert to the party! 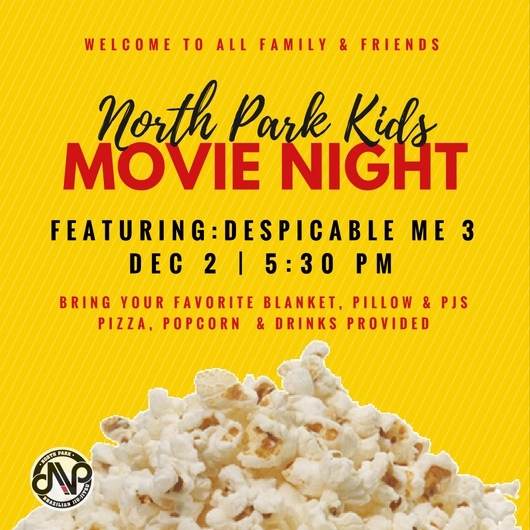 Join us for NPBJJ 2nd movie night at the gym! Watch Despicable Me 3 with you friends and family on the mats at North Park Jiu Jitsu! Pizza, Popcorn and Drinks provided! Wear a White GI with a NP Patch on it. Join us in our first Kids Costume Class! BRING YOUR PARENTS TO CLASS NIGHT! Parents have the opportunity to train with their kids on the mats! No Gi or experience necessary | During regular class times. Bring water & Sign waiver before class. **JIU JITSU KIDS - WE WILL BE HAVING A FIELD TRIP TO THIS EVENT, CONTACT COACH PAULETE IF YOU WOULD LIKE TO ATTEND! Cash Prizes! ** Contact Professor Mike if interested in competing. "Jiu Jitsu in the Park is an outdoor open mat and expo event open to grapplers of all ages and experience levels. We partner with local, non-profit companies to help raise money and awareness. Previous events have supported organizations such as Karma Rescue, the Keep a Breast Foundation, Hire Heroes USA, and the Natural Resources Defense Council. We also showcase exciting grapplers in our Gi and NoGi exhibition matches. 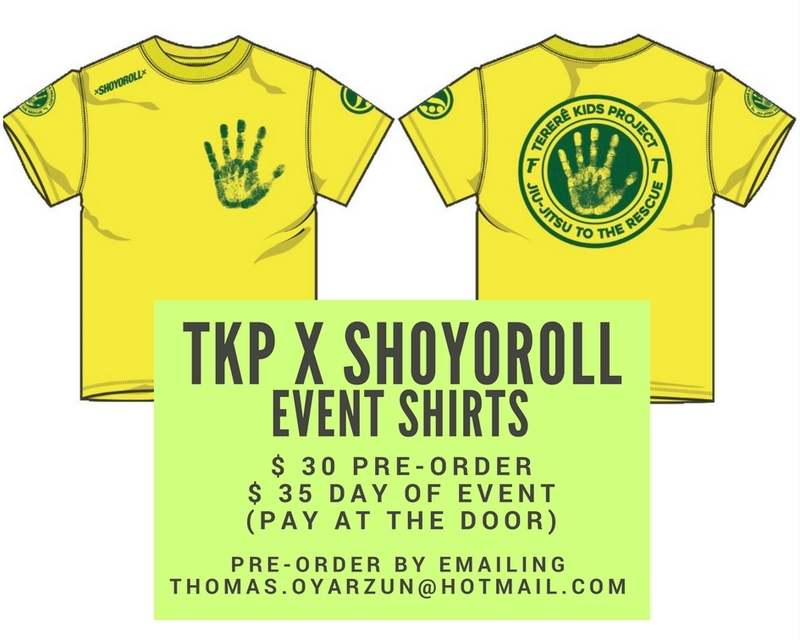 We raffle donations from different companies in the grappling and non-grappling communities to event participants. " On August 19, we set the template for all to enjoy and Experience The Future of Jiu Jitsu // Tickets are AVAILABLE AT DOOR FOR $10 General Admission // 20+ KIDS pro Series Super Fights // For More Information, check out www.subcon.tv. Come out and support Kanoe Blane Lopez!! TICKET PRICES: PURCHASE TICKETS FOR LIVE EVENT AT FRONT DOOR OF EVENT. ALL GENERAL ADMISSION SEATS ARE FIRST COME, FIRST SERVED, MEANING THERE ARE NO ASSIGNED SEATS. THERE IS AN ELEVATOR AVAILABLE AND THE VENUE IS ADA COMPLIANT. 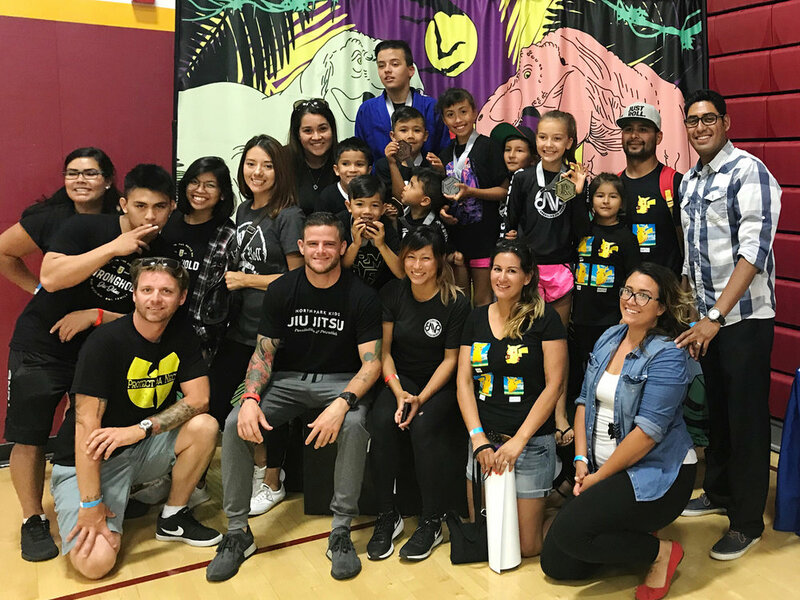 First ever North Park Kids MMA Night with Coach Paulete & Coach Kel! Wear gym (No-Gi) clothes *shorts with no pockets, rashguard, shirt. No gloves necessary. We will be having a demonstration and booth! Looking for demo and booth volunteers! Watch the new Lego Batman the Movie on the MATS projected on the wall!